Yangpu Bridge, with its length about 602 meters, is the world’s long cable suspension bridge. It is a sister bridge of the Nanpu Bridge. These bridges were built to ease traffic flow on the Huangpu River in the centre of Shanghai. The construction of Yangpu Bridge was completed in September 1993 and it was opened for traffic in October. The bridge was designed by the Shanghai Municipal Engineering Design Institute, Shanghai Urban Construction College, and Shanghai Urban Construction Design Institute, with assistance from Holger S. Svensson. 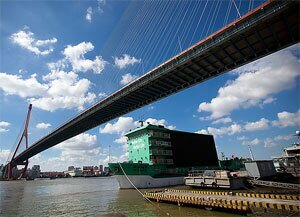 It was built by the Shanghai Huangpujiang Bridge Engineering Construction company. It is a heavily travelled bridge carryingin excessive of 5,000 cars per hour during rush-hour traffic. It connects the Pudong region in the east and the Puxi region in the west. All new suspension bridges are complete and they expandand contract daily due to temperature swings, most noticeably throughout the summer heat: its middle section increases by some 10 centimeters and it stretches by about 6 centimetres throughout the strongest midday heat. The length of bridge is only 1172 meters; the entire length of bridge, including the end supporting the Anchor Bridge on land is about 7654 meters. The bridge is nearly 30 meters wide and it accommodates a 3-lane road in any direction. Its clearance height - distance between the under-side of the bridge and the river underneath it, at usual water levels, is about 48 meters. Furthermore, the big, roomy span of the bridge proper means that through fewer abutments/ pylons, there is more space for shipping traffic. Therefore, it accommodates approximately 45,000 watercrafts per day. Yangpu has 2 major abutments supporting high, upside down, Y-shaped towers from which are strung backup cables. This design is both well-organized and very stylish, imparting the graciousness to it that sets Yang Pu apart from its peers. Additional detail that sets the bridge apart is the bridge&apos;s name - handwritten by the much-admired former Chinese governor, Deng Xiaoping. Deng was one of most respected communist leaders in China; he led China in the wake of the Social Revolution. It was not painted originally however as part of the universal Millennium celebration in the year 2000, it was painted a good-looking red. On each side of the bridge is a 2-meter-wide path for walkers. The river flowing underneath is the Huangpu. Location: No. 88 2175 Lane, Pudong Road (sightseeing office). You can find the Yang Pu Bridge on several maps of the city. You can cross Huangpu River anyplace near the downtown area just keep both eyes peeled for the beautiful suspension bridge. 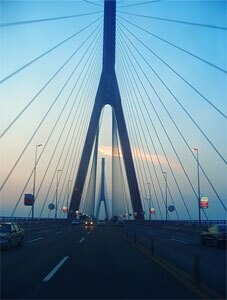 You also look for the Pudong Highway, which will take you to the river, and also to the bridge. Admission: There is a RMB 5.00 toll for all vehicles driving on the Yang Pu Bridge.